Grandma was the best fudge maker. When the snow started flying, out came the wooden spoon and saucepan. And, oh boy, did we gather around for the best treat in all of the north woods. FUDGE!!! Butter sides of sauce pan. 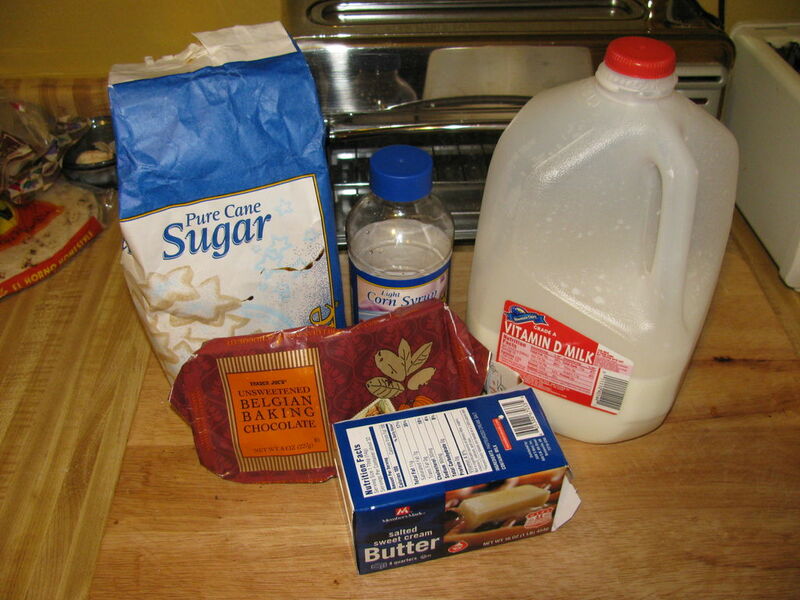 Add sugar, chopped chocolate, milk and corn syrup (or cream of tartar). Place over low heat on stovetop. Mix well to dissolve sugar. Stir constantly until mixture boils. Continue to cook, stirring occasionally, until mixture reaches 234 degrees on candy thermometer or until small amount of mixture forms a soft ball in very cold water. Remove from heat. Add butter and vanilla. Cool mixture to until pan is lukewarm to touch. (Do not stir while cooling!) When cooled, beat vigorously until mixture loses glossy appearance. Quickly stir in nuts and pour onto buttered pan. Spread evenly. Cut into pieces when cool and firm. 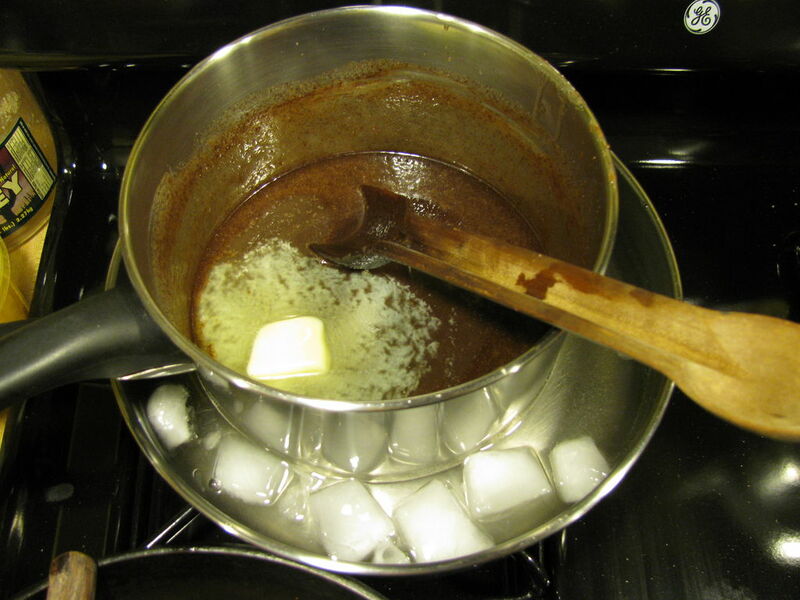 Once you've added all you ingredients to the buttered sauce pan, it is very important to stir constantly to ensure the sugar is dissolved before the mixture begins to boils. Be sure to scrape the edges of the pan with your wooden spoon to incorporate all the sugar. 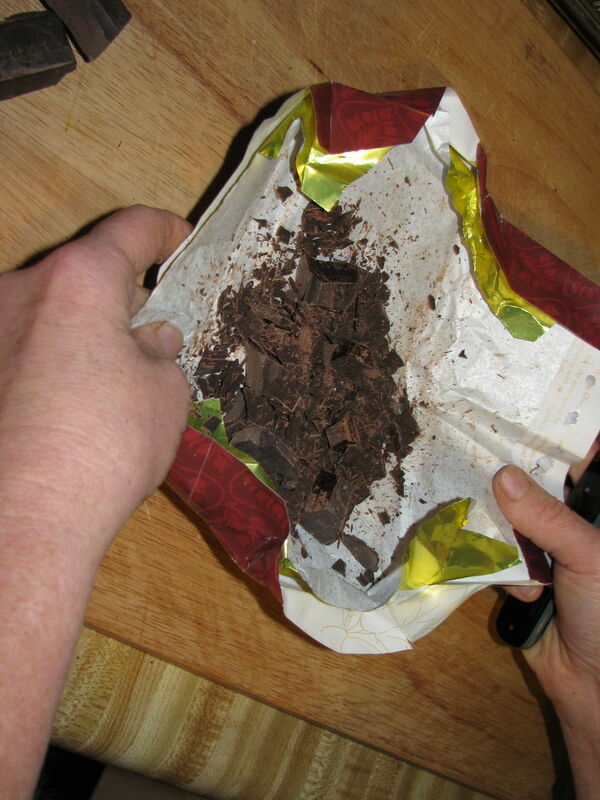 Chopping your chocolate is a good idea. This allows it to melt faster and help it to dissolve into a homogeneous mixture sooner. While tempting to increase the heat to hasten the process. DO NOT. Fudge making requires a bit of patience! 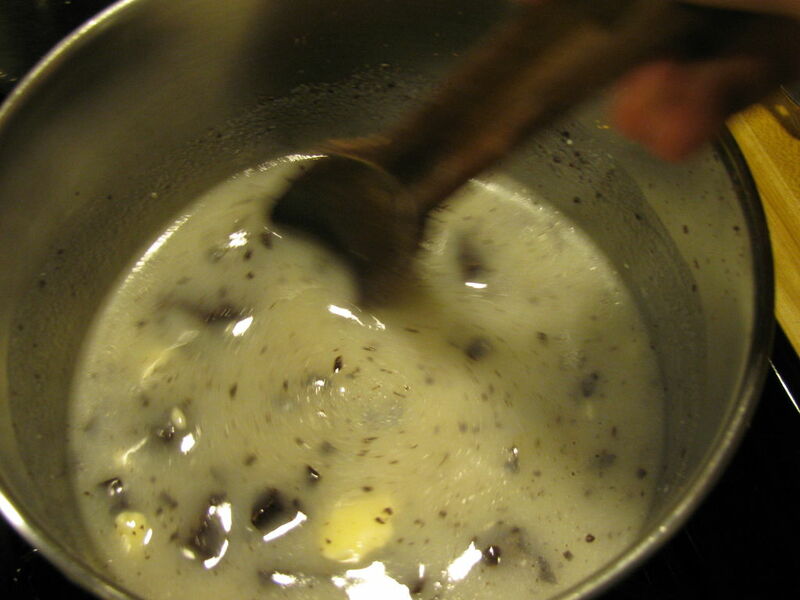 Once the mixture begins to boil, you will note that it begins to thicken and darken (subtle changes). At this time, fill a small bowl with water and a few ice cubes. Pour a small amount of the mixture into cold water in the bowl. Attempt to make a ball with it with your fingers. The mixture should form a ball, but loose shape as you attempt to lift it out. If it does not form a ball, continue to boil. Repeating this process with new cold water until the ball is formed. Remove from heat at this time. Allow your fudge to cool, don't hurry this step either. I place my saucepan in my frying pan filled with approximately 3/4 inch of water and a tray of ice cubes. Grandma used to fill the sink with a couple of inches of cold water. Stirring is labor intensive. Use a sturdy wooden spoon and encourage all to lend a hand. 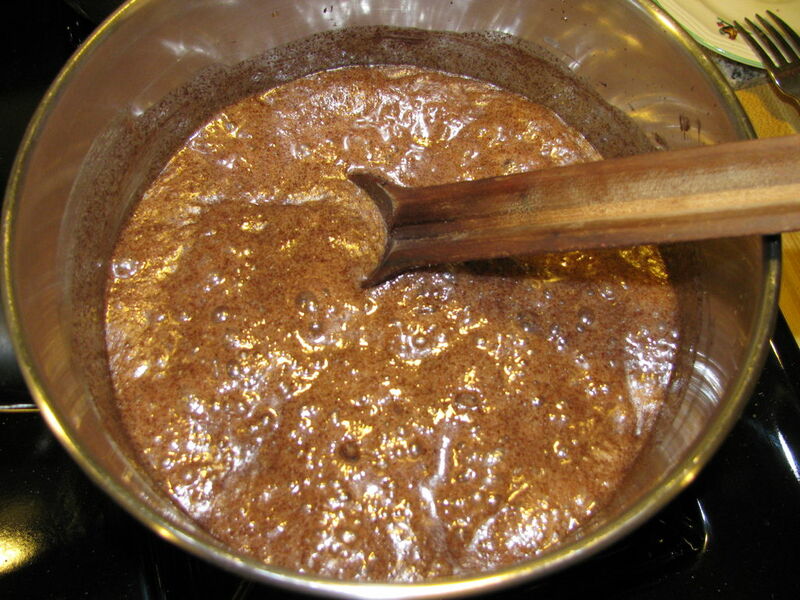 Once you notice the gloss disappearing from the mixture, the fudge will "turn" quickly. With no time to spare, mix in the chopped nuts. Pour onto a prepared buttered pan and spread evenly. Step 5: .....package...... and ENJOY! Cut into pieces and place on circles of plastic wrap. Secure with a pretty ribbon. Share with the ones you love. HAPPY HOLIDAYS from the LINUX FAMILY! My boyfriend's mom got all us girls together last year and we made a fudge very similar to this one. The only difference was the measurements. Mine came out really great last year. I was so proud of myself. This time, I don't know what I'm doing wrong. The first time, it came out like caramel and became as hard as butterscotch. The second time, it was a bit creamier, but crumbly and not chocolaty enough. This time, it's chocolate coffee grounds. Maybe I didn't stir it enough at the beginning or I let it cool too long. It was at about 135 degrees when I went to try and stir it. The pan felt hot to me, but the mixture was okay to touch. It was very hard though. I didn't stir it after adding the butter and vanilla. Three strikes, I'm out LOL. Maybe I'll humble myself and ask his mom for help or just stick to n00b recipes like cookies and cakes LOL! very similar to our fridge recipe. We add 1/4 tsp salt. Corn syrup not cream of tarter. Ours never comes out smooth. But it's good. We do use a thermeter. Also, we find that weather has a big play in this. When it's dry and crisp not cloudy and humid the fudge comes out better. Also we don't double the batch. Sounds crazy but it comes out different. And the same recipe we made all day. As the day went on it came out different texture. I remember my mother using corn syrup (Brand name Karo) but not cream of tartar. Her's was always smooth and creamy. In step X, you say to remove from heat, add butter and vanilla, and cool, but specifically call out to NOT stir during cooling. I'm assuming you mean mix in the butter and vanilla, and THEN let cool? I made this once and did the above, and it basically came out, but I wanted to make sure I was reading that right. No, don't mix in the butter/vanilla. Just put it on top of the hot pot (it will melt) and don't stir until the bottom of the pot is cool enough for your hand to be placed on it. My fudge never got creamy like yours looks in the picture. Mine has a really grainy texture like the sugar never quite dissolved. as a child I watched my Mom make this very fudge...rarely was it grainy, but when it was it was because it was over cooked/got too hot. she never used a thermometer. I too have made it and had it come out perfectly. just takes some practice. Low heat until the sugar dissolves. And stir constantly. Grainy fudge is part of the learning process. Hope the hints help. 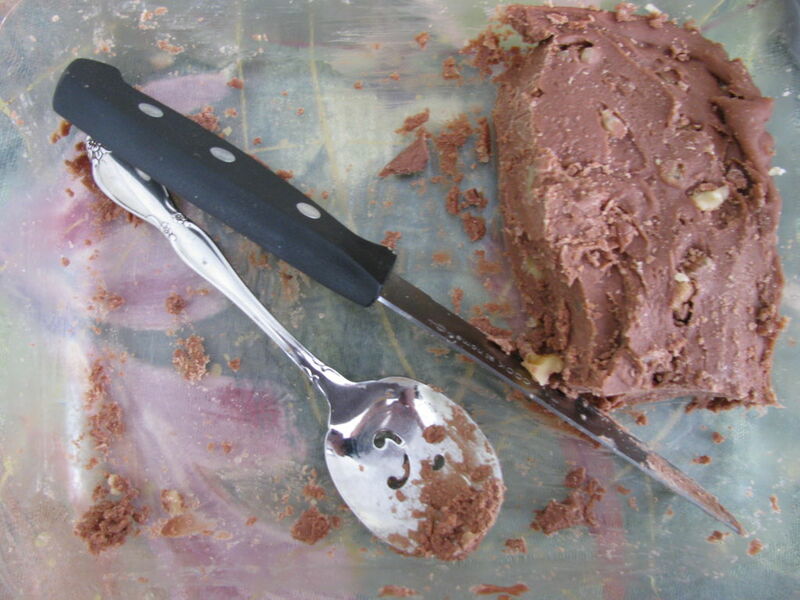 The grainy fudge wasn't any worse than the spoon fudge, now was it? Be honest - it still tasted good! Honestly, I'll take fudge at any stage of the process (bites for Linuxmom anyone??) and trust me no grainy fudge ever got tossed in our home!! I'm eager to give this another shot. Any idea how long that part should take? I love the way you have all these things in your equipment list and then you say afterwards that your grandma wouldn't have had them ? My mother had one like this, and it's gotten lost. Best I can remember, it was 1 cup of sugar, 1/4 cup milk, 1 square of chocolate (baking), a lump of butter (probably about a Tbsp) and a capful of vanilla. The rest would be just as you have it, although we rarely got to put nuts in and we never had corn syrup or cream of tartar. Sometimes we wouldn't cook it enough, and we would be "forced (?)" to eat it with a spoon, but considering that it tasted the same, and was the consistency of creamy caramel, there really was no punishment there. Sometimes, we even tried to do it that way, and now fondly remember Spoon Fudge! Great Instructable! 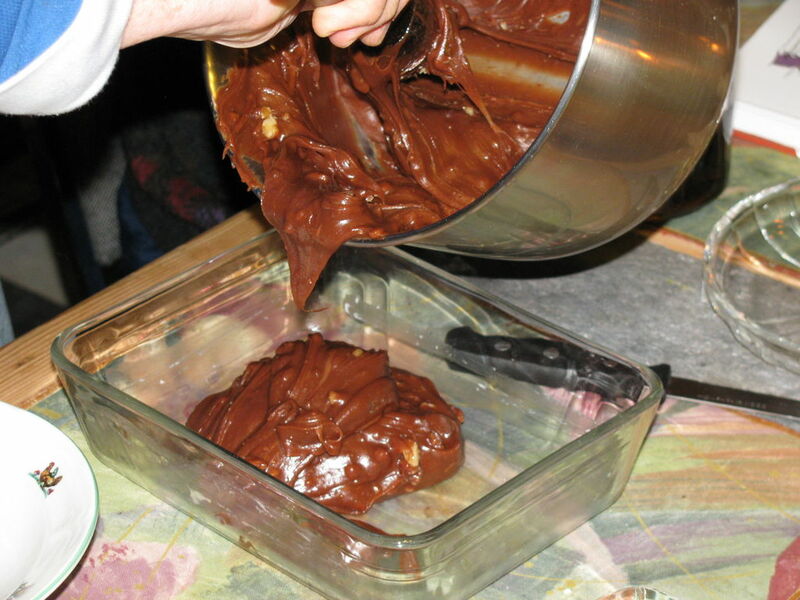 I just made a big batch of fudge and it turned out great. This was my first time ever making fudge and I am very pleased. Thank you, thank you! This is very like my favorite fudge recipe--I misplaced it 15 years ago and have regretted the loss every Christmas since! So this Xmas will be merry and bright.........enjoy!! We added some chipolte powder, along with cinnamon. It gave it a nice spice kick. Finally - a real fudge recipe. Your family must be very pleased with you (and your cooking)! I've been making this for 40 years but as I got older I began to want it less sweet and with a more intense chocolate flavor. 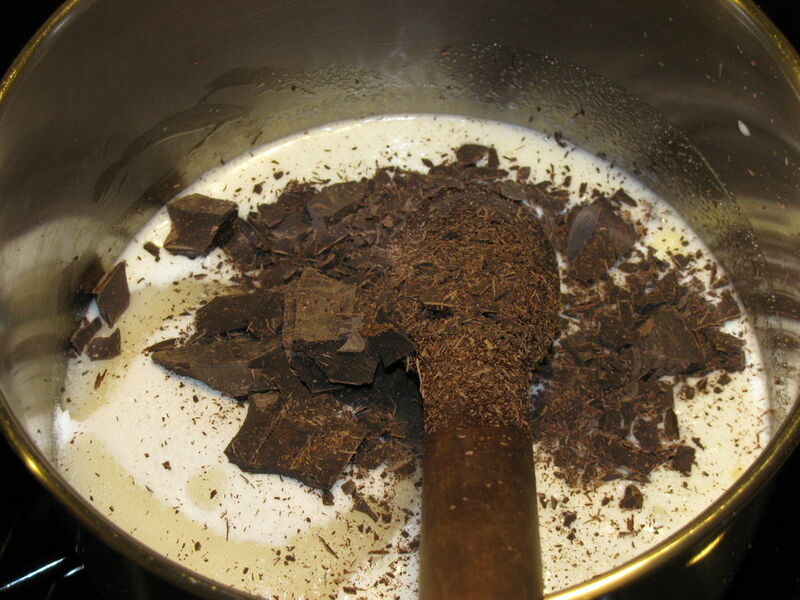 I gradually changed the recipe until now the flavor of my fudge is more like Dark Chocolate than Milk Chocolate. My ingredients are almost identical to yours but the proportions are different. 2 Cups of Granulated Sugar 3 Squares of Unsweetened Chocolate (1 square equals 1 ounce) I use the best dark chocolate I can find. 2/3 Cup of Half and Half (In a pinch I've used milk and even skim milk but NEVER evaporated milk) 2 Tablespoons of Corn Syrup or 1/4 teaspoon of cream of tartar 1 1/2 teaspoon of good vanilla (I prefer the extra boost) 2 tablespoons of butter For your step 3 I loosely cover the pan with a lid for the first few minutes and the resulting steam keeps the sides of the pan washed free of any sugar crystals. For your step 4 I've always let the fudge cool at room temperature and then after beating it I've always turned my fudge out onto a buttered slab (these days I use a Silpat mat) and I run a butter knife through the fudge in patterns until it sets up into one big "cowpie". My kids have always loved getting their own cowpie on their birthdays. My daughter came home from college last month for a visit and of all the gifts she got she was most pleased I remembered her cowpie. Once, for fun, I made a fudge "cake" for a friend. I made a regular batch as the usual large circular cowpie. Then I made a second batch and poured it out into a medium circle and a small circle and stacked all three of them into a 3 tiered layer of fudge as a fudge "cake". It was a hit at the party but if I ever do it again I will put foodsafe discs under the layers to make it easier to cut. 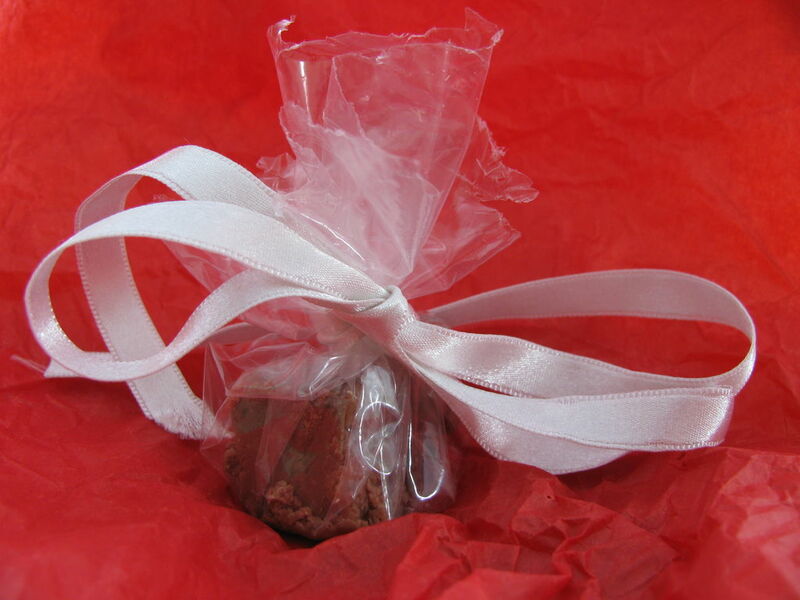 (Similar to what they use on wedding cakes) I also make ginger fudge and peanut butter fudge in the same manner. ps. Don't try this on a humid day or you will become very frustrated.